From early May to the end of July 1925 the violin virtuoso Fritz Kreisler toured Australia and New Zealand giving recitals in major cities to overwhelming acclaim. 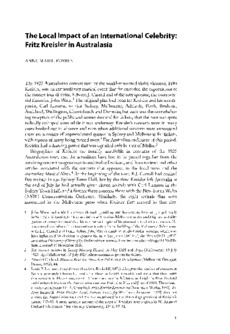 This article provides the first comprehensive account of Kreisler’s entire Australasian tour detailing the repertoire performed and considers evidence for the impact of this repertoire and of Kreisler himself on local performance scenes in Adelaide, Melbourne, Sydney and Brisbane drawn from concert programs and newspaper reviews. The role of the media in shaping Kreisler’s reception is explored, focusing on pervasive quasi-religious imagery that painted Kreisler as a cultural ‘knight in shining armour’ for the Antipodes.